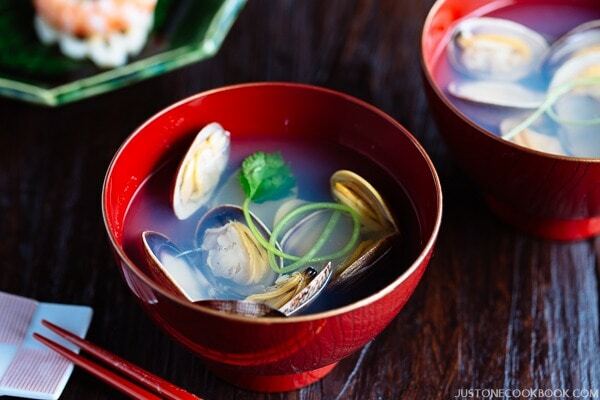 The classic Japanese Clam Soup is made with clear kombu dashi broth and Manila clams, and traditionally served for Girls’ Day (Hinamatsuri). This light and flavorful soup takes only a few ingredients and 15 minutes to prepare. Although Japanese restaurants outside of Japan serve miso soup with just tofu and wakame seaweed, there are many variations of miso soup in Japan and we also have some soups that do not contain miso. 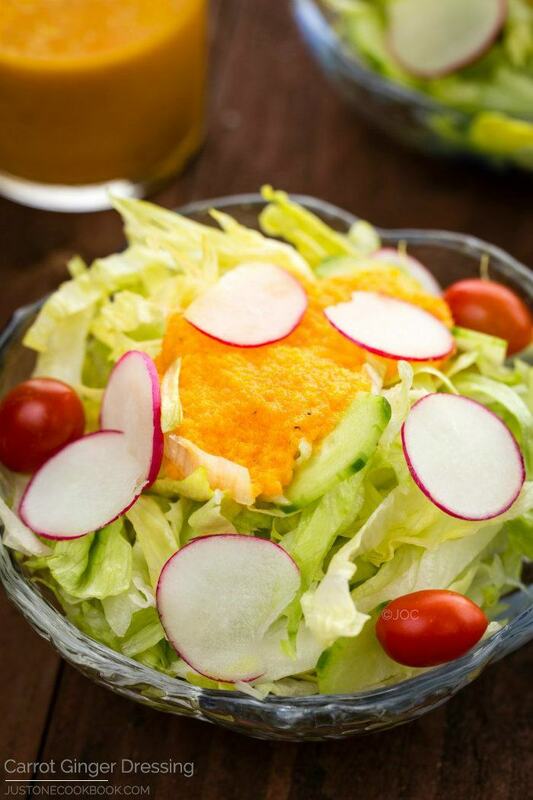 As Japan is surrounded by the ocean, we have many abundant fresh seafood to enjoy with our soups. 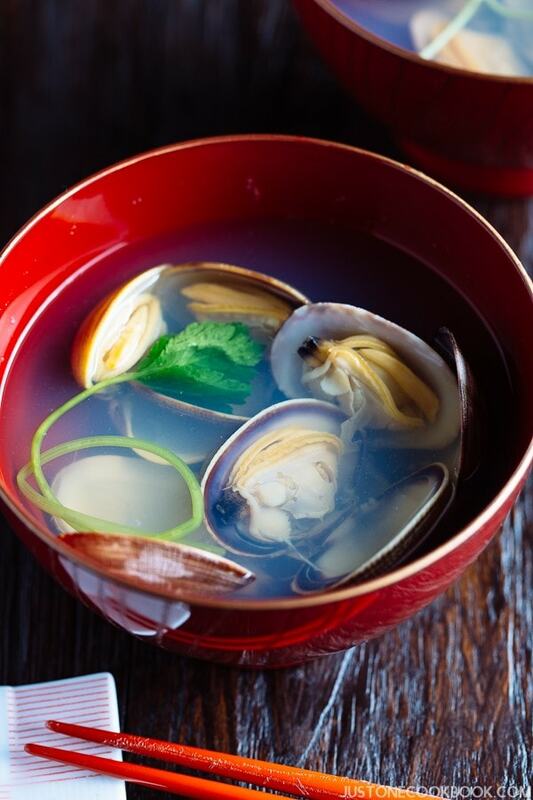 Today’s recipe, clam soup is one of the most popular soups enjoyed throughout Japan. We have two types of clam soup in Japan. One with miso (recipe here) and one with clear broth. Today I’m sharing the version with clear broth, or what we call Sumashi-jiru (すまし汁). Clear broth doesn’t mean it’s plain water. For Japanese clear broth, we use Japanese broth called dashi, which comes in different types (Learn about dashi). When we use clams in the soup, we want to make sure the flavors coming from the clams is the prominent one. 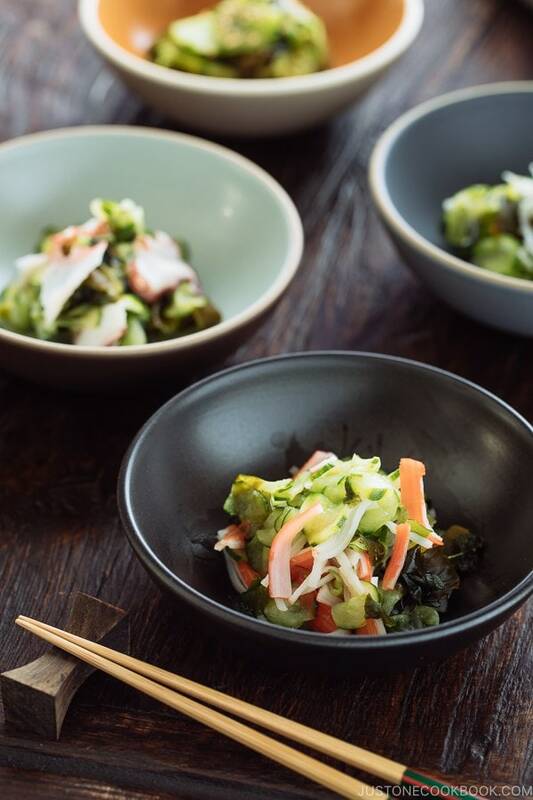 Therefore, we use dashi that has the most subtle flavor – Kombu dashi. The most commonly known Awase Dashi, or dashi with kombu and katsuobushi (dried bonito flakes) is a bit too strong and it might ruin the clams’ flavors, so I wouldn’t recommend using it. As the recipe is so simple, I can’t stress enough that the quality of ingredients and attentions to details for cooking this soup do matter. To begin with, use fresh clams. They are flavorful and succulent, make sure to de-grit clams so your soup won’t eat any sands or grits that might be off-putting. I have a detailed guide on how to de-grit clams (Japanese way). You’ll be surprised how much stuff come out from so-called “ready-to-use” clams you purchased from the store. Other important ingredients are a small piece of kombu and a little splash of sake. The little piece of kombu has so much umami in there that you should extract the flavors slowly (pre-soaking and slowly heating up). 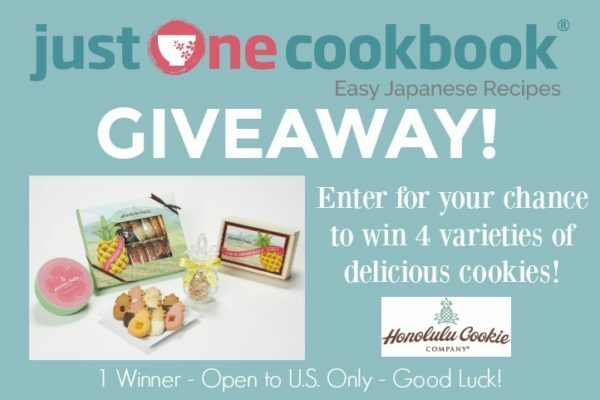 Try tasting the soup before and after adding sake. Sake is made with fermented rice and it has umami and sweetness in there while masking the unwanted smell that sometimes accompanies seafood. After adding sake, don’t you feel the essence of the broth sharpens up? It’s a bit hard to describe, but the Japanese believe the magic in sake and the big difference it makes with a dish. 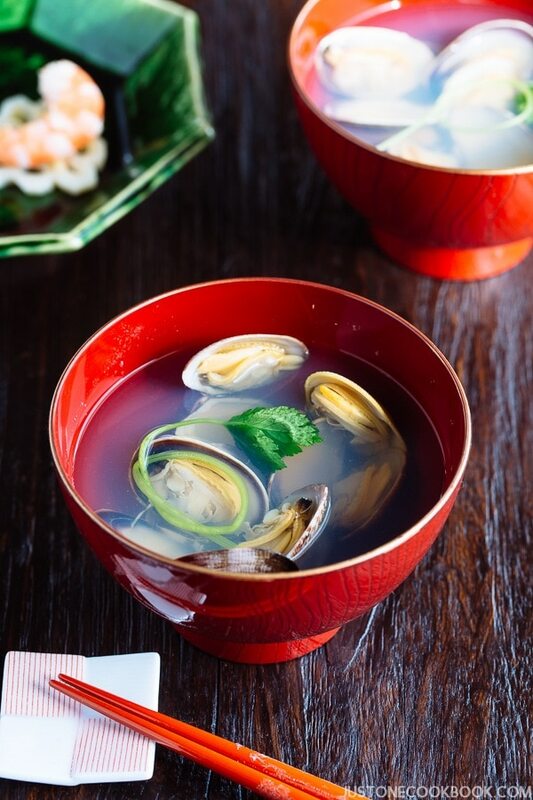 As many of you already know, clam soup with clear broth is a signature dish to serve on Girl’s Day (Hinamatsuri), which is on March 3rd in Japan. 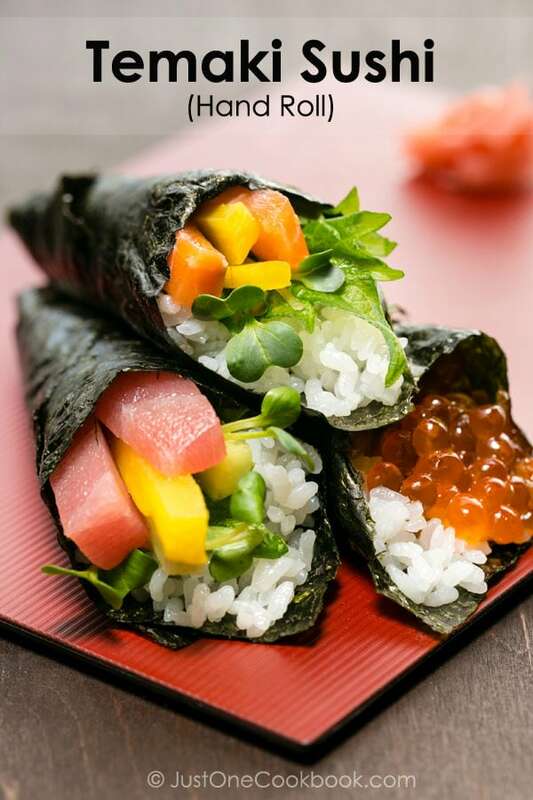 The soup is usually served with Chirashi Sushi, a colorful sushi with ingredients scattered on top of seasoned sushi rice. 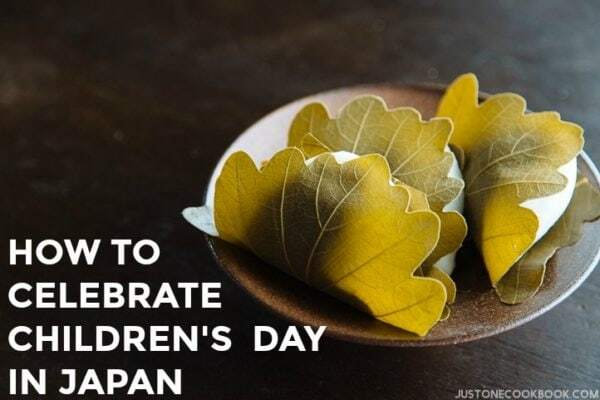 Some sweets like Sakura Mochi and Hanami Dango are served as well. Please read more about this custom here. 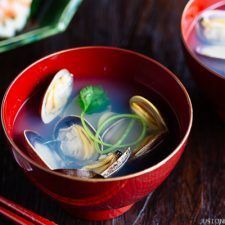 The classic Japanese Clam Soup is made with clear kombu dashi broth and Manila clams, and traditionally served for Girls' Day (Hinamatsuri). This light and flavorful soup takes only a few ingredients and 15 minutes to prepare. After you purchase manila clams, you will need to de-grit. Even though they are “ready to use”, I highly recommend doing this process. 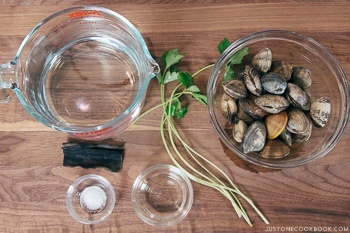 Please see my How To De-Grit Clams post. Gather all the ingredients (clams should be scrubbed and clean after de-gritting). Put water, kombu and clams in a saucepan and start cooking on medium heat. If you have extra time, I recommend adding kombu in water first to let it seep for a longer time. When small bubbles are around the edges of the pot and water is almost boiling, discard the kombu. You can also skim the foam to make very nice clear broth. When boiling, turn down the heat. 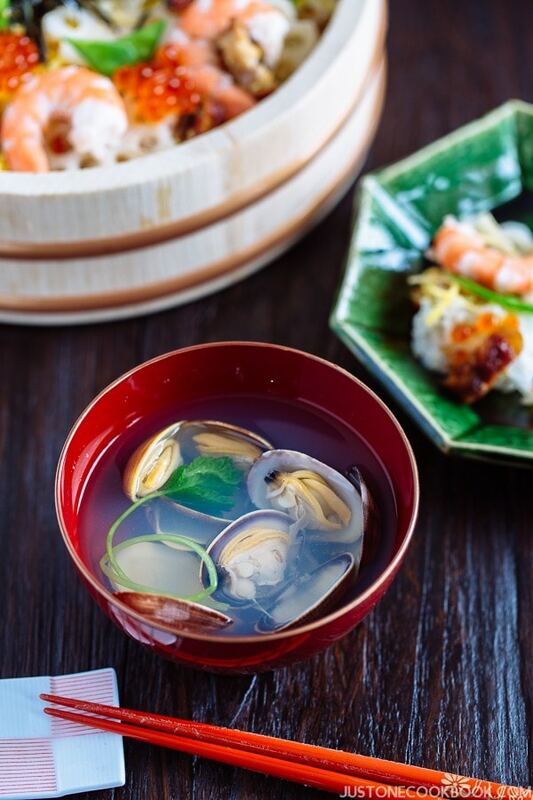 When all the clams open up, add sake. Taste the soup and add pinch of kosher salt if needed. 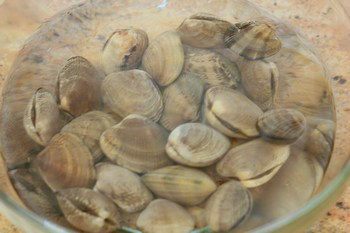 The clams will get chewy and hard when you cook for a long time, so turn off the heat and serve. Prep time does not include the time for de-griting (which can take 1-4 hours). This is one of the finest Japanese dishes I’ve ever experienced. My home-stay Okaasan made this for dinner early on in my stay in Kyoto years ago, and I remember it like it was yesterday. The flavors are very subtle, very complex, and very delicious. Thanks for putting a spot light on this recipe; I’ll be sharing it with my family tomorrow. A perfect Japanese dish. What a classic, elegant and deceptive soup as far as simplicity goes . . . thank you especially in stressing that plain kombu dashi might suit best and any bonito flavour could be too strong. The moment I”ll next see really beautiful clams it will be made. [Must admit to laughing out loud that the prep time did not include the possibly hours’ long degritting procedure 🙂 !!! Hello Eha! Dashi can be personal choice but my recommendation is kombu. 🙂 AHAHAHAH yes, de-gritting time can be deceiving. I know many recipes skip this part and say “use ready-to-use clams”… but I know how much clams purge by doing this extra step and you don’t want to see all that impurity stuff in “clear soup”….. LOL! Hmmm! *weekend laugh! 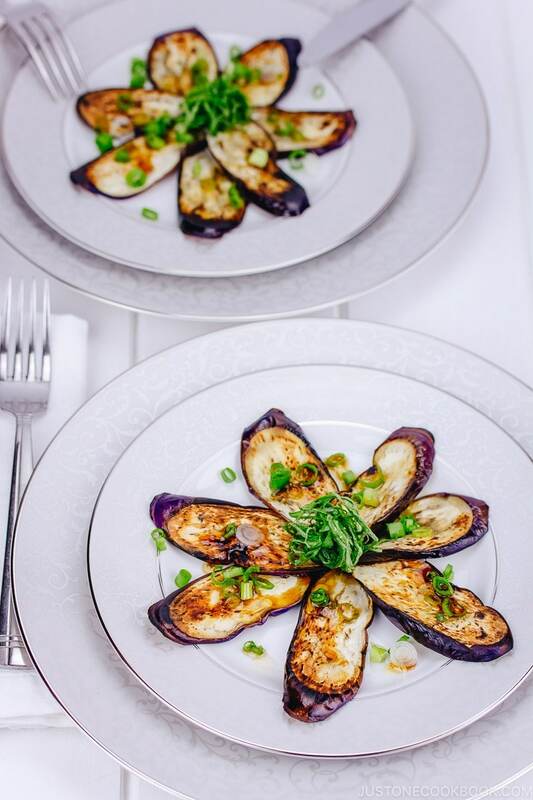 * – belonged in a gourmet dinner group of four couples . . . my turn to entertain . . . . clams for eight as first course in one pot . . . would not open, would they . . . had not degritted but shook the pot to bits hoping to get eight serves of open beasties: well, you can imagine the disaster as far as the wine cooking sauce was concerned can’t you . . . 🙂 !! Ill try to make this tonight!